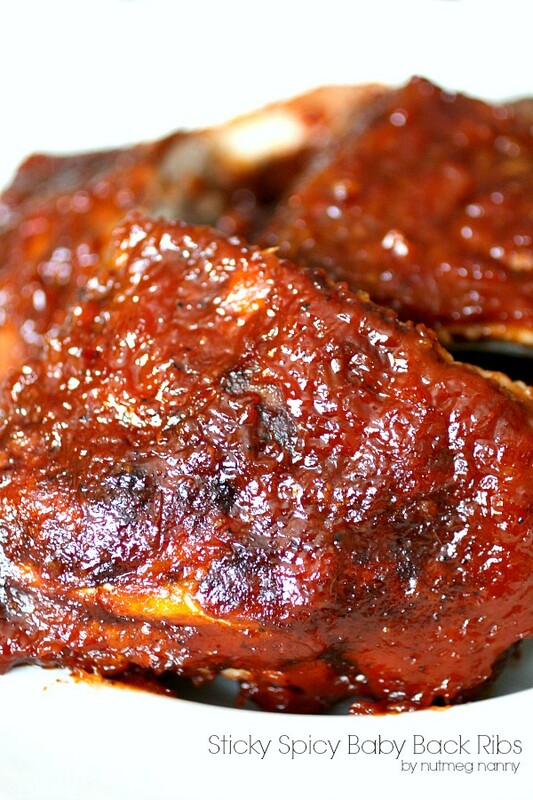 These sticky spicy baby back ribs are perfectly sweet and spicy. If you don’t own a grill don’t worry. 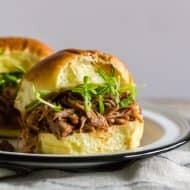 I give directions for making these in the oven too! These ribs are delicious. They are dry rubbed with a delicious mix of dark brown sugar, paprika, chili powder, smokey cumin and allspice. I let the rub sit on the ribs in the chill chest for approximately three hours. They were baked and then basted with a delicious homemade sauce. We currently do not have a grill so at the end I threw on the broiler and browned the sauce on the top. Whisk together brown sugar, salt, and spices in a small bowl. Line a 17- by 12- by 1-inch heavy-duty baking pan with a double layer of foil, then oil foil. Pat ribs dry and arrange in baking pan. Rub ribs all over with spice mixture and marinate, meaty sides up, covered and chilled, 2 1/2 hours. Bring ribs to room temperature, about 30 minutes. Cover pan tightly with foil; bake 1 1/4 hours. Remove foil. Cook onion, garlic, and ginger in oil in a 2-quart heavy saucepan over moderate heat, stirring occasionally, until softened, about 6 minutes. Add remaining ingredients and simmer, uncovered, stirring occasionally, 15 minutes. Purée sauce in 2 or 3 batches in a blender until smooth (use caution when blending hot liquids). Set aside 1 cup sauce for serving with ribs. Prepare grill for cooking over indirect heat with medium-hot charcoal (moderate heat for gas); see Grilling Procedure. 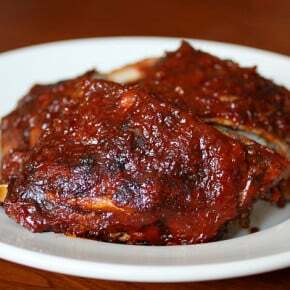 To cook ribs using a charcoal grill: Lightly oil grill rack, then transfer ribs to area of rack with no coals underneath, reserving pan juices, and cook, covered with lid, basting generously with pan juices and sauce and turning over and rotating ribs every 10 minutes (keep ribs over indirect heat), until tender and browned, 30 to 40 minutes total. Transfer ribs to a cutting board and let stand 5 minutes before cutting into individual ribs. To cook ribs using a gas grill: Lightly oil grill rack, then transfer ribs to rack above shut-off burner, reserving pan juices. Grill, covered with lid, basting generously with pan juices and sauce and turning over and rotating ribs every 10 minutes (keep ribs over shut-off burner), until ribs are tender and browned, 30 to 40 minutes total. Transfer ribs to a cutting board and let stand 5 minutes before cutting into individual ribs. 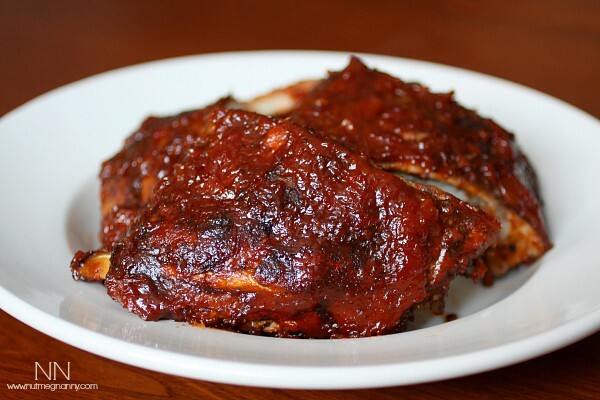 These ribs look so good, and the recipe sounds really tasty! We just got back from a popular local BBQ joint, and these look like they should be on the menu! 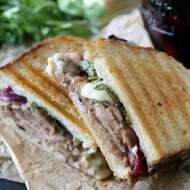 Looks so yummy I am sending it to my grown up boys to try! Can’t wait for us to try it out too! These look fantastic! I have been wanting to make homemade barbecue sauce since it is hard to find a prepared one without high fructose corn syrup- yuck! Thank you for the great idea! Just made ribs and wish I’d seen your recipe first. Will try next time. I love ribs but I’ve actually never made them! I’ve heard that using a dry rub and then basting them with sauce while cooking is the best way to go! They look amazing! I’m not much of a rib eater but even I have to admit these look pretty darn delicious. My parents would go crazy over them! I love a good rib. These look fabulous! These look awesome! Thanks! LOVE ribs! I want my baby back, baby back, baby back ribs…. Aww…blond duck took what I wanted to say. LOL!! Man I want me some ribs now. That looks really wonderful! 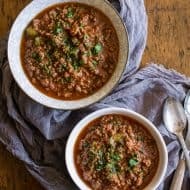 I cant wait to try your recipe this weekend.I hope you won’t mind, I’d sure love to guide Foodista readers to this post.Just add the foodista widget to the end of this post and it’s all set, Thanks! I don’t doubt that these ribs are delicious – they look amazing!!! Hope you have a marvellous holiday. Some of the best ribs I have tried!!! My 17 year old daughter made this, she baked it in oven. Best ribs ever!